Hey, friends! Hope you’re having a great Wednesday. I was dragging this morning (something about the mid-week slump! ), but I’m finally feeling with it! By the way, thanks for your sweet words about our upcoming vacation to Nebraska. I know – a vacation to Nebraska in the middle of winter?! We’re crazy – but we’re so excited to see family and friends. Although it’s been in the 60s here for the past week, so I’m kind of nervous for the weather. Apparently it’s supposed to get down to 14 degrees tomorrow night in Lincoln, NE. Um…brr! Anyway! Lately I’ve been snacking on a pretty darn healthy option. With the holiday season of sweet treats in full force, I’m trying to find ways to sneak in some healthier snacks. Of course I’m enjoy things like peppermint ice cream and chocolate-drizzled kettle corn at night! However, I’m trying to stick to healthy snacks during the day. Balance during the holiday season (and every season!) is so important, my friends! I received a coupon for Marzetti Otria Greek Yogurt VeggieDip through the Clever Girls Collective. I was excited to try this dip for three reasons: 1) I flippin’ love dips 2) Greek yogurt is a favorite of mine and 3) I knew this dip would be a great way to eat a lot of our CSA vegetables. You know we’ve been receiving a lot of vegetables lately! I rolled with the Garlic Herb Ranch flavor. I must admit that ranch dressing is a weakness of mine. Seriously, you could slather it on anything and I’d eat it. Ok, almost anything. Anyway, the dip was very, very thick in its consistency – which meant that a little went a long way! You know how some dips can be rather runny/thin? This was not the case. There was a great tanginess from the Greek yogurt, and the garlic provided a nice little kick. Carrots – duh! Aren’t carrots like the number one vegetable that are used with dips? Ok, so I completely made up that statistic, but it sounds right! Celery – again, no surprise here! Potatoes – here’s a (slightly) unique way to enjoy the dip. Think of fries and ketchup – but swap roasted potato wedges for the fries, and the veggie dip for the ketchup. Voila! 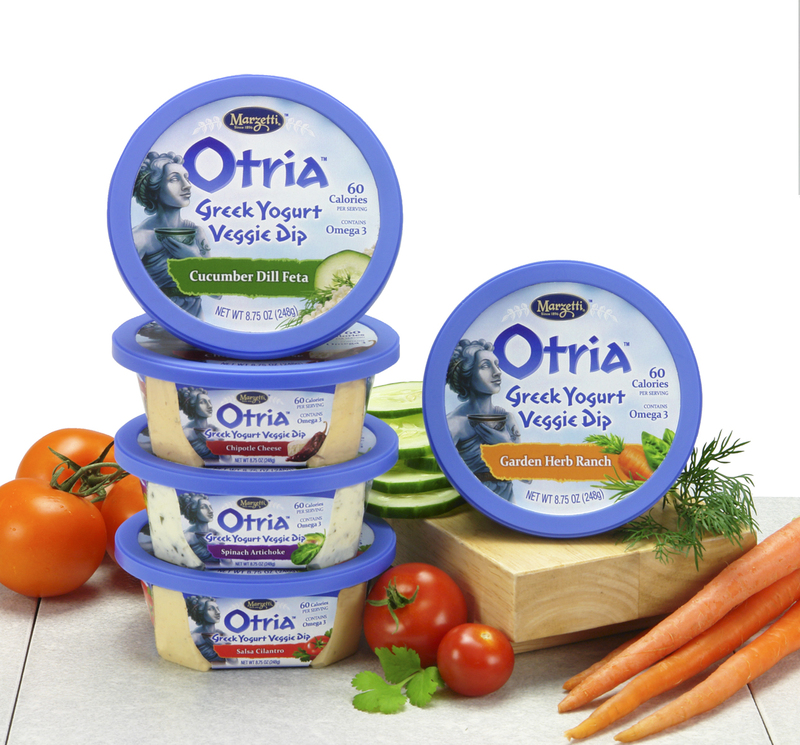 The other flavors in the Otria line of dips include Spinach Artichoke, Chipotle Cheese, Salsa Cilantro, and Cucumber Dill Feta. I think the Chipotle Cheese is next on my list – mmm! I was one of the bloggers selected by T. Marzetti Company and Clever Girls Collective to host a Marzetti Otria Greek Yogurt Veggie Dip review. They provided me with product to test and compensation for my time. However, my opinions are entirely my own.